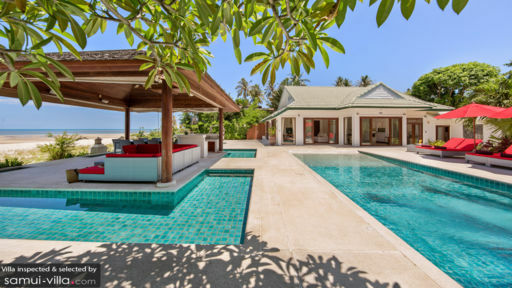 Enjoy the peace and tranquility that comes with staying in a secluded beachfront home like Villa Baan Flora. This finely appointed holiday abode offers views out to a swathe of white sand and the beautiful blue ocean, and the sound of rolling waves wafts in through the day. A range of indoor and outdoor living spaces ensure that you’re comfortable whether you’re lounging in or basking under the sun. 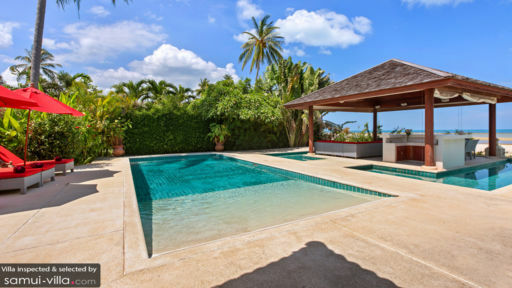 Just like any perfect tropical vacation rental, Villa Baan Flora places you just steps away from a paradisiacal beach. Four bedrooms sleep eight guests. Just like the communal living spaces, each of the bedrooms comes furnished with a modern flair. Soft cream hues, amber lighting, block-out curtains and quality linens help ensure a night of restful slumber. All bedrooms are equipped with a dressing area and private en suite. Soak up the golden rays and warm tropical breezes when you lounge outdoors at Villa Baan Flora. The pool sparkles under the sun, inviting vacationers to swim laps or take a refreshing mid-day dip. When you’ve dried off against a beach towel, enjoy your morning coffee while you lounge against one of the pillowy white recliners. A gazebo set right at the edge of the garden comes fitted with a lounge and dining area - just perfect for relaxed social gatherings by the beachfront. 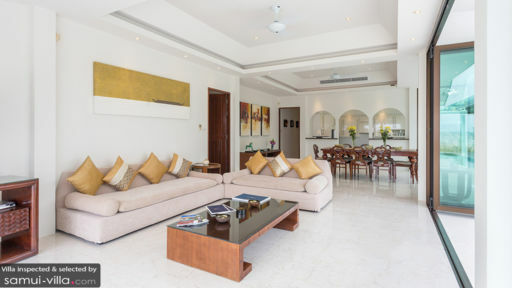 Bright and airy, the open plan living area at Villa Baan Flora comes fitted with tasteful contemporary pieces. Two sofas, enhanced with throw pillows, are set around a wooden coffee table and TV set. Behind the lounge lies an expansive dining table where guests gather for communal meals. Scrumptious meals are whipped up by a chef in the fully equipped kitchen. Villa Baan Flora is a full-service property with housekeeping services, security services, welcome drinks and a daily breakfast service. Amenities available at additional cost include room service, airport transfers, vehicle rental, personal driver services, personal chef services, laundry service and in-villa massages. The quiet coastal town of Hua Thanon is located in East Samui. Taking it slow is the way of life here; with little attractions in the vicinity and a lack of tourist crowds, it’s ideal for vacationers seeking a getaway from it all. Your villa is located right along Hua Thanon Beach. An eight-minute drive down south will lead you to Bang Kao Beach. The postcard-perfect coast boasts white sand shores fringed with palm trees, but the sea conditions here aren’t ideal for swimming. For a different beach ambience altogether, take a 15-minute drive up north to Lamai Beach. It offers spectacular sunset views, good swimming in the central and southern areas and a lively dining and party scene. There’s more to do within easy driving distance from your villa. Lamai is home to renowned cultural attractions like the Hin Ta & Hin Ya Rocks, Pagoda Khao Chedi and Wat Khunaram. Lamai Viewpoint is worth stopping for its uninterrupted views over the beach and ocean and zipline attraction. A cooking class at Lamai Thai Cooking School offers a great family experience. To unwind and recharge, join in a yoga class at Samahita Retreat or indulge in one of the incredible massages or spa treatments at Tamarind Springs. You’re just a skip away from dining venues like Sweet Sisters Cafe, a cosy cafe with a menu featuring organic fare, The Fisherman’s Outlet, a restaurant serving Thai and Western dishes and Vitamin Sea Restaurant, a beachside venue serving Mediterranean fare. Thong Krut Fisherman’s Village, located about 12 minutes’ drive away boasts a good selection of seafood restaurants. We stayed at Samui Beach Village - Villa Baan Chang from 27th June to 1st July. We were a family of 10 and we had an amazing time at the Villa. The services were all perfect right from pick ups to the day we left. The staff at the villa especially Ellie were very helpful and we were well taken care of. The highlight for us was the private pool we had to ourselves at the villa and all the appliances at the villa were working in perfect order. We have many happy memories of this trip and we cannot thank the staff at SBV enough! Cheers and hope to see you guys soon! This is our first time visiting Koh Samui from Hong Kong and also first time staying at Samui Beach Village. We stayed at Baan Flora and Baan Astasia. We have a group of 13 and all of us had an absolutely wonderful trip staying at Samui Beach Village. We loved the service, the friendly greetings, the location of the Villa, we loved them all. Prior our trip, We had a lot of questions about the trip, Villa, car rental, pick up, facility, location just lots questions and UK contacts: Will Brock and Carolyn Welding gave us all the answers and support that made us worry-free Thank you so much! Upon arrival, we already got very friendly greetings with cold drinks and towels that made us so relax as we were still trying to get used to the super hot weather in June/July season. Some of us immediately went check out all the facility as the lovely beach volleyball court, tennis court, kids playroom, gym, water pool all right beside the check-in Sala. Afterwards we arrived our Villa, everyone was so happy since the spacious and great interior design, the lovely swimming pool, all appliances were in very good condition, we already knew that this was gonna be a fabulous trip. Baan Flora is located right by the beach. Super soft sand and big beach, we woke up at 5am and viewed the sun rising, weather so cool at 5am and we had a long walk and enjoyed great morning at this fantastic scene. We also managed a great poolside BBQ dinner at our Villa with the help from the team lending us a great grill. Big thanks for helping to setup and we had lovely gatherings, also thanks to the teammate (Ms Eli and Amma and few other ladies in the office => sorry for wrong spelling) for all the assistance as we always change our planning, our rental cars got problems with tires and got super fast repair, one A/C broke down and kitchen lights were down too at nite and the team fixed it in no time, all of these services made us super happy and we highly appreciated. The location of this hotel is at the very south of Koh Samui and we specially chose this as we want to stay in a silient place away from noise and crowds and big restaurants. This hotel is perfectly located at what we want. In our four days trip, we ride around the whole island, dinner at very good restaurants (Dining on the Rock Restaurant) and the Fishermen Market (Seaside Restaurant - dinner table on lovely soft sand) and lots of local style Thai restaurants and local markets at Nathon and Chewang for shopping local handicrafts. Time went so fast and suddenly was time to back home... we all missed Koh Samui and the lovely smile of the Samui Beach Village team and we definitely will travel again to Koh Samui and of course will stay at Samui Beach Village again! Just completed a week at Samui Beach Village for extended family of 15 people in Baan Sarika and Baan Rim Haad. Had an excellent time. Accommodation varied between the 2 properties w Baan Sarika being more traditional and older accomodation w Baan Rim Haad more modern. Both right on the beach and very comfortable.